Karen Stupples, the former British Women's Open champion, claims that she was ditched by two sponsors because she became pregnant. Stupples, 34, whose son, Logan, was born in April, says she is still owed £20,000 by Hi-Tec, the sports shoe manufacturer. According to Stupples, Hi-Tec were meant to give her a cheque for £10,000 in January and another cheque for £10,000 this month but have not done so. Stupples also claims that another of her sponsors, the Dalhousie Golf Club in Cape Girdeau, Missouri, wanted to cut her annual fee of $40,000 in half, on the grounds that she would be playing less than in a normal year. 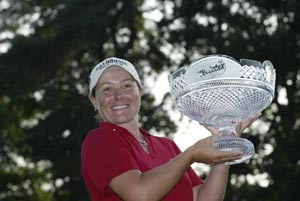 "I felt so hurt because I considered these people to be friends," said Stupples, who claims she turned down more lucrative deals to stay loyal to her sponsorship partners after she became British champion in 2004. No one at Hi-Tec was available for comment yesterday but they have told her managers, IMG, that they are concentrating their resources on Padraig Harrington and Ian Woosnam. Ian Woosnam? He still plays?